Nothing beats visiting an authentic hawker stall with locals. In fact, at a place like Newton Food Centre, it is highly advised. We were very fortunate that we had some friends who lived in Singapore. The husband grew up in Singapore, and the wife has lived there for close to a decade. They took care of all the ordering, and also warned us of pitfalls that may fall upon the unsuspecting tourist who comes here for a meal. 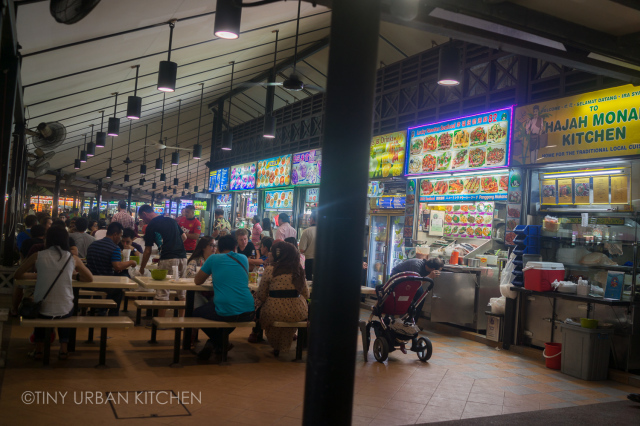 Newton Food Centre is a huge hawker stall area conveniently located close to city center. Because of its central location, it’s a popular spot for both locals and tourists. It’s huge, and there are many stalls selling very similar dishes. As a result of all this competition, some of the stall workers are very, very aggressive in trying to get your business. Don’t be surprised if people approach you immediately upon entering and start asking you if you want to order something. Frankly, it’s a bit annoying and I was really glad we were with locals so we knew how to conduct ourselves. Essentially, say “no” unless if you really want to eat from that stall. And always, ALWAYS, ask them for the price before agreeing to buy anything. Several years ago a group of American tourists were charged S$491 for a simple meal at Tanglin’s Best BBQ Seafood. Although the place was fined and closed down for three months, it’s hard to know how many less public cases happened before this one, and how much of it is still going on. First, claim a seat by putting down a small tissue pack. It’s an odd Singaporean tradition, but everyone does it. If you see a table with a tissue pack on it, you know that it’s already “taken.” It’s also useful to have tissue packs because there are no napkins to be found. Once you start eating some of these dishes, you’ll understand very quickly why it’s really, really nice to have tissues! Once your seat is claimed, you can start walking to the stalls to order your food. Typically we would just wait for the food at the stall and bring it to our tables ourselves. Once in a while, we would agree to order from one of those aggressive, hovering stall workers, in which case the worker would bring the food to our table. First things first: drinks! We got fresh coconut juice, which was super fun. If you don’t like bitter flavors, ask for a young coconut. Because we were out-of-town visitors, our friends decided to order a bunch of classic, Singaporean hawker stall dishes so we could really get the authentic experience. Rojak is an unusual salad that includes chunks of fruit (such as pineapples and jicama), cucumbers, chopped up fried Chinese cruellers, tofu puffs, and chopped peanuts tossed together in a sweet, savory, tart, and spicy dressing made from sugar, chili, lime juice, and belacan (fermented shrimp paste) . It was really interesting and like nothing I’d ever tasted before. I’m not a huge fruit person, so it wasn’t my favorite, but it was fun to try. There was one stall making Oyster Omelettes, which reminded me of a similar dish we have in Taiwan. The version in Singapore was slightly different from the Taiwanese version. It didn’t have the greens (e.g., spinach), and the chili sauce was a little more savory and spicy. Still, it was pretty tasty. A very popular Singaporean hawker stall classic is the Sambal Sting Ray, a slice of stingray served on a banana leave and doused with spicy sambal sauce. The sting ray itself has A LOT of bones – so many that it became not-so-fun to eat. Maybe the problem was exacerbated by the fact that I didn’t have any napkins and I just didn’t know where to put all those bones. We didn’t really have share plates, so I ended up just putting the bones in a messy pile on the table. The flavor of the sting ray is actually pretty decent. I’m just not sure if I’d order it again, having to deal with all those bones! My favorite hawker stall item, the Popiah, was delicious. I have always loved the combination of flavors in this simple soft spring roll, which is filled with cooked jicama and daikon, crunchy peanuts, hoisin sauce, and lettuce. Another favorite at hawker stalls is the barbecued chicken wing. These wings are marinated for several hours before being cooked over an open charcoal fire. What results is a juicy, flavorful wing with a nice smoky and crispy skin from the charcoal. Only S$1.30 for one (about $1 USD), you can put away a lot of these before spending a lot of money. Satay Skewers are also delicious, and we had several of them. Hokkien Mee in Singapore is different from Hokkien Mee in Malaysia. The Singaporean version includes two different types of noodles – vermicelli and yellow noodles – stir fried together with shrimp, cuttlefish, and lard bits. This is topped with sambal sauce and a tiny little lime. I loved the savory flavors of this dish, and the mix of noodles was interesting and unusual. All in all, it was a really fun outing. I am so thankful we had friends to help us order, because we really knew very little about Singaporean food, especially what’s good at a hawker stall. My personal favorites were probably the Popiah and the Hokkien Mee. I think Bryan really liked the Chicken Wings as well, and he probably was also a fan of the Hokkien Mee and the Satay Skewers. If you can, come with a local. If not, just make sure you ask about prices before agreeing to anything. Bring some tissues to claim a seat. As long as you follow these rules, you should be set to enjoy a fun outing at the hawker stalls. Prices are generally very, very reasonable, so you should be able to get out of there without spending too much money. Please note, not all hawker stalls are like this. My visit to Maxwell Food Centre with Bryan, for example, was totally normal and fine. For some reason, Newton has the reputation of being a bit more aggressive. The food is good and the location is convenient, but just be aware! Surprised your local friends brought you to Newton Food Centre; that’s pretty much known as the tourist trap. Singaporeans hardly go there but glad you had great food nevertheless! Ya I’m surprised your friend introduce you to Newton Food Centre. I can’t even recall my last visit or maybe I have never being there before? Singapore Hokkien Mee which is also known as Fried Hokkien Prawn Noodle, most important component of this dish is actually the stock that’s used to cook. Hours of boiling and tonnes of pork bones + prawn shells are used to make the stock. I am Dwi Astri Firdawanti as one of student in Senior High School 1 Pemalang (in Indonesia is SMAN 1 Pemalang), Central Java, Indonesia. I am writing this email because I am interest with the traditional foods from Singapore. And I hope, I can learn more about all of traditional foods from Singapore and you would help me. Please, send me some books about Singapore traditional foods. I’ll very grateful if you would send me that. I am sorry if my English is not good. But, I am only know how to speak in Indonesian and Emglish. Jendral Gatot Subroto street-52319, Pemalang, Central Java, Indonesia. please inform me if you would send me that or not. I am sorry but I do not have any books about Singapore traditional foods. However, there are many websites that are free and give a lot of useful information. Good luck! Turk’s – The Turkish Cuisine, Coming Soon in #01-03 Stall. For more info visit please Facebook @ Turk’s Singapore. Thank you….